Mansha Yad was born in a village Thatta Nustar near Farooqabad, District Sheikhupura, Pakistan on 5th September 1937.His father Haji Nazir Ahmed was a farmer and Hakim. He passed his matriculation examination in 1955 from M.B. High Hafizabad with Drawing & Science subjects in first division & obtained Diploma in Civil Engineering from G.S.E Rasul in 1957. After serving in PWD rehabilitation in Rawalpindi & Murree for about 2years (1958-1960) as a Sub Engineer, he joined Federal Capital Commission which was later converted into Capital Development Authority,Islamabad in May1960. As he had literary taste from the childhood he started writing stories & poems for children magazines when he was student of seventh class. 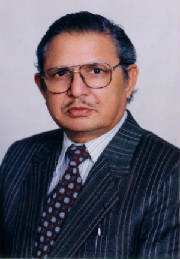 He passed examinations of Fazil e Urdu in 1964, BA in 1965,M.A (Urdu) in 1967 and M.A (Punjabi) in 1972 from University of the Punjab as external student. After serving the Capital Development Authority as Sub Engineer,Asstt.Engineer ,Exective Engineer,Public Relations Officer& Chief Complaints officer, he retired as Dy.Director in 1997. He was married in Lahore to his cousin Farhat Nasim Akhtar in 1960. He has one daughter and three sons. His eldest son Farrukh jamil is Vice Principal at Army Public School & College Rawalpindi and daughter Noma Shabnam is also teaching in a Model College for Girls in Islamabad. His son Dr.Amer Shakil is a Professor of medicines at The University of Texas, Dallas, USA. The youngest son Kashif Naveed is Assistant Manager in a National Newspaper/ TV Channel in Islamabad. Mansha Yad founded Halqa Arbab e Zauq Islamabad, the first prominent literary organization in the Capital city in 1972. He also founded some other literary orginazations such as Likhay Walon Ki Anjuman, Rabta, Bazame Kitab & Fiction Forum in Islamabad enriching the newly built city literarily& culturally. His first short story appeared in1955 & his first collection of stories was published in 1975.He has been continuously contributing Urdu and Punjabi stories to literary magazines. He has by now published 9 collections of short stories including one in Punjabi. A Novel in Punjabi Tanwan Tanwan Tara and many TV Serials & plays are also at his credit. He is settled in Islamabad and taking active part in promotion of fiction and literary activities. He is also writing an Urdu novel and his auto-biograph y. He was given Presidential Award ‘Pride of Performance’ on his literary services in the field of novel and story writing in 2004.He has also obtained many awards on books, stories and literary services including the life time achievement award of Aalmi Frog e Urdu Adab Award in 2007. For the promotion of art of short story writing Mansha Yaad offers free consulation for Young Urdu and Punjabi writers.